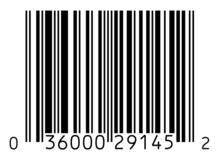 The most popular barcode is that used for retail goods identification called Electronic Article Numbering 13 or EAN13 for short. You will see this barcode most items in a modern store that uses a Point Of Sale (POS) electronic ’till’ to scan you purchased item in the store and provide you with your itemised receipt. You can use the label designer included free with most label printers to create EAN13 store barcodes. You should note the importance of the EAN13 barcode numbering system being controlled in Europe so that each supplier is registered and uses a different country / supplier number and banks of allocated item numbers. This is so that no two suppliers products have the same number as this would obviously be confusing and say a barcode number itentifying a portion of cheese in the UK could be wrongly identified as a bag of potatoes in Spain! If you are looking to get registered for barcoding then contact the GS1 organisation (www.gs1uk.org) in then UK or identify your local barcode registry in your country. You may also encounter or need to use the following types of barcode…. Another multipack barcode style called EAN128 can include the country and the supplier and the item number but also an expiry date so fresh items can be tracked as to the displayable life and USEBY or BEST BEFORE status for the customer. Many of our customer don’t need to sell product in retail stores but still wish to identify items with barcodes to automate identification. Then they use code39 or better code 128 barcodes. Both of these can contain a mix of numbers and letters (alphanumeric) and even special character like a hyphen for example. There is no need to register these codes with any organisation so go right ahead and use code 128 its a more modern code with better readability by most barcode readers and more characters can be encoded than the older code39 type. yet still all the information being readable by automated means. Larger barcode labels are often needed for pallet labelling so that the details of the labels can be seen from a distance or when up on high rise racking and even scanned using long distance readers or automated pallet processing system sin large stores. The ODETTE pallet label is a specification used in the automotive car component and similar parts supplies industries. that when reading the information at the receiving warehouse the variable data fields are correctly identified irrespective of the reading order. Optionally the sending supplier forwards and electronic document containing the codes that can be then checked off on receipt a sort of electronic delivery note. 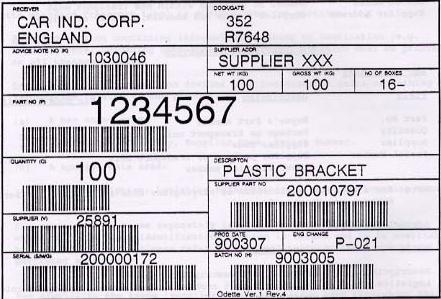 The SHIPPING CONTAINER CODE (SCC) outer case or pallet label varies in format but again is an labels that contains barcodes to identify variable information fields but often also containers a serial number so that each case or pallet can be identified as part of a set. 0001 , 0002, 0003 etc and so that any missing case or pallet (shortage) can be immediately recognised. By uniquly identifying each pallet its possible to ship different mixed goods on each pallet that can be easily recognised and sorted at the reciever. 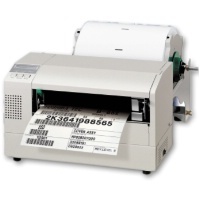 For over 30 years I have been supplying thermal and thermal transfer printers for barcodes like the popular TOSHIBA TEC EX4 series shown in the video below, they are 300 or 400 and sometimes 600dpi and a traditional method for barcode label printing say in default black on white labels. However for the last 12 years full colour label printers with much higher dpi like 1200, 1600 and even 4800dpi have shown that barcodes can be printed even more accurately and precisely and at the same time including full colour pictures of the items on the label for ease of identification as well as an ever increasing list of ingredients, nutrition, instructions for example. The two videos show the black only print capability of a thermal printer verses the full colour and finer print capability of a modern colour printer. Both have their place.